Rocky Mountain Institute profiles 10 remote communities transitioning from oil to renewable energy. Islands and remote communities are disproportionately dependent on oil. Oil powers the way people get around, the ships and trucks that import essential goods, and, often, the electrical grid. Most islands and remote communities rely solely on oil for their energy needs, which puts them at risk of supply interruption and exposes them to high, volatile electricity prices. The average electricity rate in most Caribbean nations is at least three times higher than the average rate that consumers pay in the U.S. (which is 12.5 cents per kilowatt-hour). However, these risks, coupled with falling technology costs, are bringing energy alternatives to islands and remote communities, according to a new report by the Rocky Mountain Institute (RMI). The report profiles 10 locations around the world that have made the transition from oil-based systems to microgrids with significant renewable energy penetration. While the motivations differ slightly in each case, the primary drivers of renewable energy adoption were cost reduction, environmental concerns, and the abundant availability of local energy resources. Necker Island, a private island owned by Sir Richard Branson, is one of the most highly publicized remote microgrid projects in the world. Branson, who backs RMI and the Carbon War Room, announced plans last year to phase out diesel and make Necker a test bed for innovative technologies. 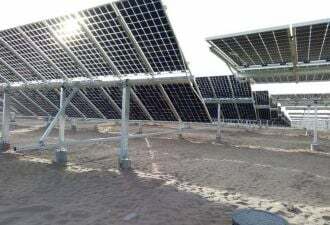 The island currently has a 300-kilowatt solar plant and a single 900-kilowatt wind turbine, a 500-kilowatt battery and advanced microgrid controls planned for installation in 2016. Getting off of oil isn’t only possible on privately-owned islands, however. Several other islands with larger populations are also making the shift. For instance, the island of El Hierro, one of the Spanish Canary Islands, recently transitioned to generating 100 percent of its electricity from renewables. The environmentally protected island is home to 11,000 people, as well as a desalination plant that’s crucial for the island’s agriculture industry. The combination of wind power and pumped hydro storage using an extinct volcano crater resulted in a renewable microgrid capable of meeting El Hierro’s unique energy needs. Kodiak, Alaska, the second-largest island in the U.S., is right behind El Hierro with 99 percent average annual renewable energy penetration. Kodiak’s 75,000-kilowatt microgrid includes several wind farms, three hydro turbines, a 3-megawatt lead-acid battery and a flywheel, which has enabled the community to build a much larger shipping-dock crane for use in the fishing industry. 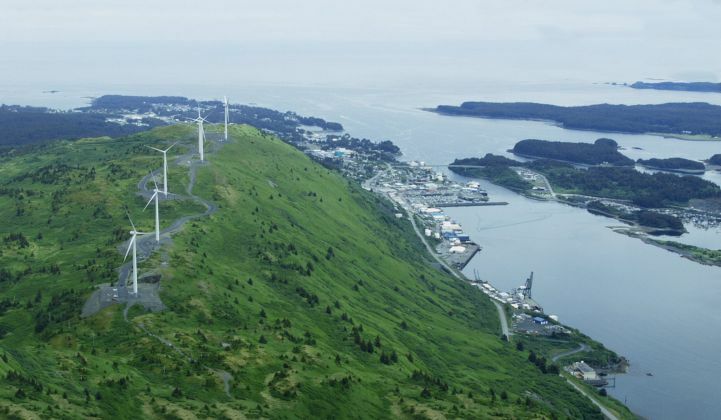 The addition of renewables and energy storage has reduced electricity rates for Kodiak’s 13,000 residents by 3.6 percent since 2000. Overall, the community now saves around $4 million per year. But Kodiak also had to overcome several challenges. The island’s remote location made it difficult to deliver wind turbines. There were also issues related to the system design, funding, and turbine construction, due to extreme weather variations. Many of the communities discussed in the casebook cited procuring and transporting new technologies and equipment to their remote locations as a major challenge. Finding skilled workers to construct the projects was also an issue. Funding was another hurdle. Most of the renewable microgrids profiled in the report relied on a combination of government grants and utility equity. As a result, many communities struggled with complex grant-application processes, onerous documentation requirements and delayed timelines. Maintaining grid stability while incorporating more renewables, especially those that are variable, was also a major challenge. “We started adding renewables 18 or 19 years ago, and the challenges have been technical. We had to solve the problems we uncovered as we went,” said Simon Gamble, a representative from King Island in Australia, in the report. These case studies show that it’s crucial to take a phased approach in any renewable energy transition, whether it’s taking place in a 100-megawatt city or on a 2-megawatt Caribbean island, said Kate Hawley, senior associate at RMI and an author of the report. “Islands didn’t immediately go to 100 percent or 80 percent renewables; they really had to bring [renewables] on incrementally. […] This phased approach helped push them deeper into the savings potential,” she said. Many island and remote-community leaders also relied on grid integration studies. “They were really looking at the technical capacity of the grid and what they could bring on now, and what they would need to do to bring on more,” Hawley added. In Hawaii, the renewable energy transition happened so quickly that the utility is now curtailing wind power. Utilities in remote locations -- and on the mainland -- stand to benefit greatly by conducting proactive assessments of their grids and the potential for distributed generation, according to Hawley. 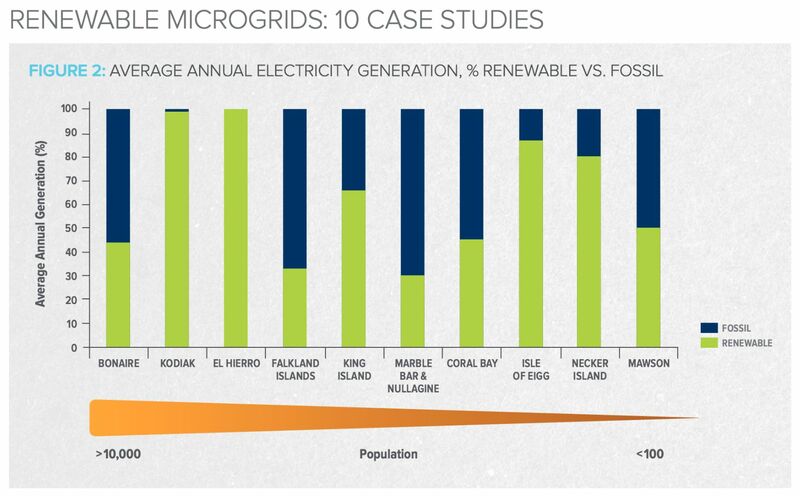 Examining the U.S. island and remote-community microgrid market, GTM Research finds that 64.3 percent of operational generation capacity is conventional, the vast majority being diesel-fired. Renewables, mostly represented by wind, account for 35.7 percent. “Interestingly, solar PV represents a small portion of today’s operational generation mix, though it is expected to significantly impact future developments -- particularly those in places like Hawaii,” said Omar Saadeh, senior grid analyst at GTM Research. As the Kodiak case demonstrates, energy storage is also playing an increasingly important role as renewable energy penetration grows. Islands and remote communities don't have enough buying power to drive energy storage costs down significantly, but they are leading in terms of strategic and technical planning, said Hawley. Without a large central power grid to rely on, remote microgrids have no room for error -- or they could face a full-blown outage that disrupts the community's entire economy. "So they have to be really smart in the way that they plan."